Our dog walkers are professionals! 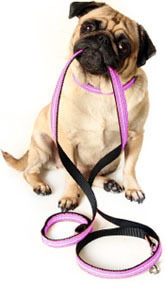 Our dog walking program is designed to give your canine companion something to look forward to everyday. Dogs require physical and mental stimulation just like humans do. If proper exercise is provided on a daily basis, it will energize their body, mind and soul. Many dog behavioral problems are the result of isolation, boredom, and insufficient exercise.